As many of you, I have never been to Greenacres. Being a Northern Lad, I seldom travel south of Knutsford service station. Just like southerners rarely make it past the Watford Gap. In fact it is a journey in the past made with angst and impending thoughts of trauma. My daughter was at Birmingham, and I was making the journey to answer a maths problem, which I probably could no longer do, or probably never could answer, or taking one unhappy young lady back to Uni. but always stuck in a traffic jam south the of Sandbach. Yet today, 25 years later, I kept on rolling, rolling, ever closer to Greenacres, only 6 miles of the motorway, just 1 hour from Manchester. So the location is a good one for many of us, in England, probably even better for Southerners, who dare brave the Black Country. Arriving at Greenacres, I was greeted by clouds scudding across the sky, penetrating squalls of rain. Whilst safety tapes screamed and wailed in the wind. Not a chance of any flying I thought. Yet I could see a model battling through my perceived mayhem. The weather did improve, still very windy, yet model after model flew. Looking at the flight line i could not be but impressed by the assembled models. Of all types, sizes, some under tarpaulins, which were removed as the day wore on. I spotted the trade tents and had a nosey, maybe not great in numbers, but offers and deals were to be had. What of the people? This was and is not Woodvale, full of anonymous individuals and their families. No this was far better, people whoses postings you have read on the forum, real people, fellow modellers. I made acquaintance of possibly all the moderators, and many contributors to the magazine. So many names that you will all know. These are friendly individuals, with same interests as you. Not super stars of the modelling worls, who are aloof, down to earth modellers, eager to help. Now the flying, to windy for a wimp like me, not for many, as model after model did its thing. Again these are real models, not circuit queens, that only come out to impress the masses. These were models impressive in their own right, not just because they are big or super fast. Did any models stand out, of course, because of my own prejudices. So I really enjoyed seeing a Fw 190D and a Me 163B, stically and fly. Average sized models, IC powered and me a confirmed electric flyer. What did fly, well there were Jets, electric Foamies, with everything inbetween. How about the flying atmosphere, very relaxed, with many models flying simultaneously. It all seemed to work well, even slight hiccups, were tolerated, recognising what they were, given that ever present gale. Did I buy anything, well yes, a chuck glider for granddaughter No.1, as requested, in envy of granddaughters No.2 model. I left having the thought, there were quite a few small items that I need, which I did not buy, just because i did not recognise that I needed them. Will I be going again, defiantly yes, as this is a modellers event, not a trade show, or a formal competition and all that goes with those formats. It is a relaxed fun event for everyday modellers, who get to see and mix with well known individuals, all kindred spirits. As for the journey home, yes, I kept on rolling along. Unlike the M62, the M6 flowed, at least on Saturday. Great appraisal of the day Erfolg , I certainly enjoyed it, and also meet a lot of the forum contributors . Glad you were able to get there, Erfolg, and your comments echo how much I enjoyed visiting last year. Well worth a day out if you're within striking distance - there's still Sunday to go, so if you've any doubts, set them aside and go! Nice to meet you Erfolg, and to be able to put faces to names and as you say it was a cracking event, shame the weather couldn't have been more kind. I don't think I could add much more as you have said it all, but if any of you out there are in doubt about attending this one, then just get yourselves there, great venue, great people and great models. Sorry I missed you Erfolg! - and you too Tom. I arrived around 10AM, and was non stop busy chatting to friends old and new, inbetween a couple of flights with my Bede BD5 EDF. Rounded off with a great night down at the pub with all ( well most ) of the RCME gang. Will be back 2morrow, and hoping the rain keeps off. Just a reminder, folks, that if you have any pics or videos from Greenacres, post them over here, ta! Good to meet you Erfolg, glad you enjoyed it despite the weather. Good to meet you too Tom. I agree with you entirely Erfolg. I went last year and had a great time. Weather this year forced a late cancellation. I can't justify coming up from Cornwall and not do any flyin'. Van hire, hotel etc. So you see a southerner does travel north of the Watford Gap-where ever that is!!!!!!!!! I'd like to have said hello Erfolg, but without nametags there's no knowng who is who. I did find Martyn, Martin, Andy, Richard, Lee, Andy, Chris, Danny and 'the Bosses' amongst others. I know there were lot's of models hiding in cars and for myself I never got round to flying the 'Bolt so I'm taking it back again today. If you spot an old codger in a scruffy red motorbike jacket please say hello! I am in agreement with you in the fact that i do not like travelling too far from home especially if the weather is not going to play ball . But it is nice to put faces to names , and have a chat face to face with those of whom you may of spoken to on-line . I would of liked to of come this year and show you all my designs but as the weather was not so good it would of been a wasted journey for me what with ( bad light conditions and rain ) photo opportunities would not of presented them self again as last year . I did however attend the Greenacres do earlier this year as the weather was great , shame not so many forum member where their but the greenacre crew where great and i did have a chat with a great many others their who commented on how well my Sipa 200 flew . I also flew others despite having engine troubles and motor problems which are now fixed . Maybe as we are all connected via forum small events like this could be organized in the future based on present weather conditions as dates could be moved forward or back as i can not see the weather being as predictable as it once was in the past . Here is what it was like earlier this year sorry you all missed out on the weather . But their is always next year . Look at those skies and tee shirts . Just 3 weeks earlier . I would have liked to see name tags ,as I have still to meet Timbo Erf , and a few more of the regular contributors. It was really interesting to meet Tim and Netty , and have a chat about the great models on display in their mobile hanger. Did meet Ian Jones and was miffed to find he was so much younger looking than me lol. Dave Ashby was easy to spot as the posh camera and RCME jacket was a dead give away lol. 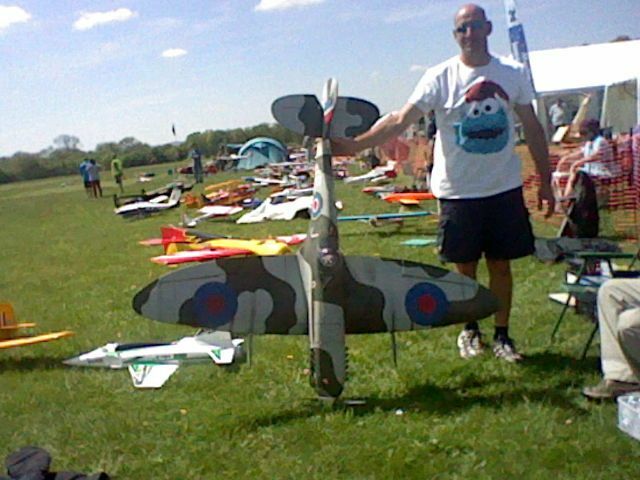 It was an absolute pleasure to meet ex Scale champ and current Panther builder David Vaughan , along with monster Panther constructor David Muir , will look forward to seeing the model fly at Winterton David. Had a interesting catch up with Rich , Debs , and fellow gyronut Rich E , who fllew his RPG and Mustang so well in the demanding wind conditions, as did Rich H with the Panther that proved it could cope with virtually anything ,the wind chucked at it. Beb was constantly surrounded by modellers at the midday meet up , which was good, plan to make it easier to recognise many of the forum faces , but again,as Bob said above, name tags would have been a help ,for those not to shy to be identified. A great day out for modellers ,and flying all day long to aspire to . Just as I had suspected, all those that attend have a similar view of the event. As a one time BARCS leauge competitor and competition director, the approach and atmosphere is so different. It is not about organisation on a rigid biases to get thought the number of rounds, to a set of rigid all encompassing rules. The attendees, are not super competitive, and the tensions and determination and stresses which go with competition. A different sort of fun event. A bit like sadomasochism. 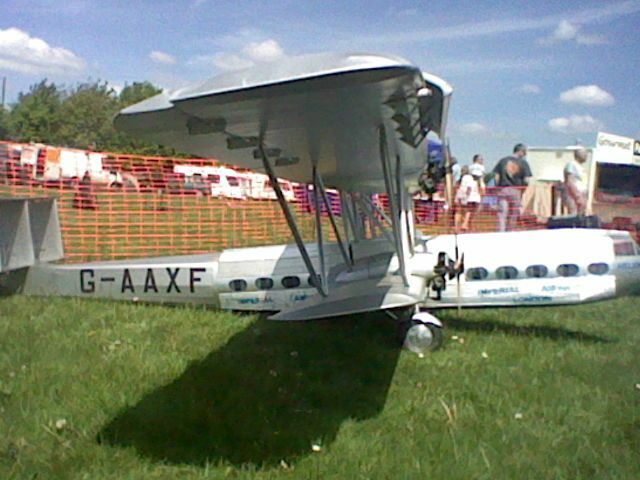 However all these events were not, nor intended for fun or participation of the club modellers, very much exhibition of the extremes of what is possible. Not aimed at casual participation, nor the interchange of views, knowledge, idle chat, raising aspirations of the majority. The Greeacres event is about modellers at club level, about participation, about knowing that the guy next to you has a lot in common, with respect to modelling. It is most definitely a "Fun Event", even when the weather is not perfect, it remains fun. Ironically I did spy a BD5, late in the afternoon on its way to the flight line. I noted the large air intake to the fan. I was tempted to speak to the modeller, resisting, as I could see they were about to fly, not having flown. I was impressed by yet another humble foamie, which handled strong wind. Being a lover of BD5 aircraft in all their forms, an opportunity missed, it would seem. I should have guessed it was the acclaimed Tim, by the permanent forward lean, acquired from years of standing on the Great Orme. Apparently no amount medical treatment will cure this affliction. Again missing many people like Tom is disappointing. Unfortunately a name and picture board, would probably be to extensive for the approach to be feasible. Yet the name tag would work and be low cost. I just cannot emphasis, how chatty and helpful modellers are in this format, and how much fun the event is, even when not directly participating. I hope it continues for many years. So I hope we can see you again a Greenacres Carl, hopefully with a better weather. It was good to talk to you, putting a face to the man writing numerous threads and comments to the forum population. Having seen the yo-yo game the wind was playing with some of the planes during approach I was a whimp like you and my precious balsa and foam creatures stayed in the boot. Let's hope for better weather in 2014 and let's meet again! I think you were trying to talk to me while I was paying for my "goodies" at the trade counter. You went back to buy a chuck glider after my kids had pestered me to get them one. Sorry I didn't get chance to talk to you properly but it was nice to meet you! I have just got home, the rain seemed set for today and my children were cold and wet, but we had a great time even camping in the rain. I do not remember the incident, getting between someones desire to part with money, is not the done thing, but what ever I said would have been trivia and can only apologise. I certainly did return later to buy a chuck glider. Which I have assembled, and test flown in the garden. The conclusion is that the Multiplex Fox glider is far better, than the Estes Falcon Glider. The first thing is that the Multiplex is EPO and much more robust than the expanded polystyrene used with the Falcon, also it flies better. I suspect it will not be long before I will have to replace the Falcon. I think the name tag idea is a good one. I have only one reservation about E-Mails, is that the very truncated nature of them, an awful lot can be lost and misunderstandings occur. I think this is because we do not start on the same page, as with work colleagues. Also when working, a lot more thought and thorough checking takes place, the correspondence rewritten until satisfied. I have asked what i thought was a question, to find it was taken as a statement of some fact. So meeting and talking to people can be most rewarding, for many reasons, as the questions and answers are addressed in real time, avoiding many misunderstandings. So see you next year Wolston! No need to apologise, If only had I known who you were at the time. I agree with you about the chuck glider, ours is already broken, I should have waited and got a Multiplex Fox. I hope to see you next year Erfolg and that it is sunny and dry! if you purchased a multiplex fox - you have the perfect little hotliner! You can easily motorize and radio control it. you will find a lot of material about it on the internet. And it works! even the old Austrian could do it! it flies amazing, for sure not slow, but it takes also reasonable impacts without bigger damage. Just do it - if you need one for your relatives, then buy yourself another one! This was also the first model I few on this island - as Keith - a friendly guy at MKMAA - just put the radio into my hands while his conversion was in the air! Result: I had to make one for myself! I can vouch for the fact that VA looks completely different without the beard! At first I did not recognise him! Erfolg - it was an absolute pleasure to meet you! We have a lot of things in common so its alway interesting to meet up. You are so right about the event - I thought a very telling moment was at the end when the raffle was draw - winners names were called out - sometimes they were not there, perhaps having been on Saturday or left a bit early - but every name was known! Its like being in a small "modelling village" where every one knows everyone else! Brilliantly fun and intimate. I would like to say your opening lines do sum up the Greenacres events, and not just the RCM&E one, but all of them. Long may it continue. It would be great if the RCME fly-in went to different places each year, meaning that people (such as myself) who live very far from Greenacres can go to the fly in some years. It would make it more accessible in my opinion. I will try and come next year, see how things go.